Sèlvans Association works for the preservation of our most outstanding and high natural value forest heritage, as well as the valorization of the ecosystem services they offer us. Our four lines of activity are preservation, health, training & awareness rising, and scientific research. 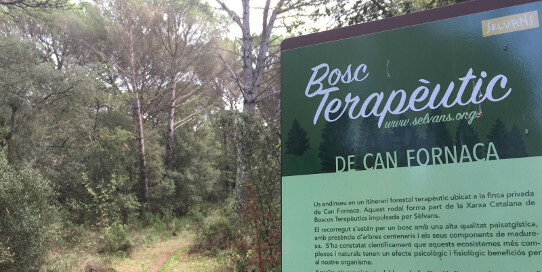 In relation to health and the wellbeing of people, Sèlvans is progressively deploying a Network of Healthy Forests and Therapeutic Forest Itineraries, with seven tracks already operational this 2018 in the region of Girona. “Forest Bathing” consists of a calm stay, accessible to everyone, in a forest with therapeutic functionality, ideally accompanied by a professional guidance and in reduced groups of maximum 15 people. The benefits on health and wellbeing are produced above all thanks to the aerobiology of the forest atmosphere, a slow walking, the silence, the relaxation, the conscious breathing, the contemplation, and the (re)connection through all our senses with a high quality natural surrounding.